Redcloud and Sunshine Peaks are two of the easier 14ers in the San Juan Mtns, and as an added bonus, could be done together in a single outing without much additional effort, about 10mi with 4,000ft of gain. They lie above the Gunnison River canyon, west of Lake City. I had saved these for when Eric could join me for a few days before our regular week-long visit in Telluride with another friend. Eric had met me in Lake City around 5p the previous evening, following a 6hr drive from Albuquerque, NM. We had dinner while I gave him the bad news about the jeep, but the good news about the plans I'd crafted so we wouldn't lose any climbing days. I'd arranged to have the jeep looked at by the local mechanic in the afternoon, leaving us the morning to go climbing. The only bad thing, really, was that Eric was going to have to drive to the TH in the morning, something we'd planned on using the jeep for. And as it turned out, the road up Gunnison River to the Grizzly Flat/Silver Creek TH was in excellent shape, suitable for just about any vehicle. His RAV4 managed it just fine. We'd gotten up at 4a and to the TH by 5a, all to satisfy Eric's concerns for Colorado's fickle mountain weather. Not all that excited to start in the dark, I had whined quite a bit the night before, but it all worked out for the best. The first 45min by headlamp went by quite peacefully as daybreak gradually dawned and we could put away headlamps. The first thing I noticed as it got light was that this area was less green than others areas in the range, with vast slopes of broken talus on either side of the Silver Creek drainage our trail ascended. Not as stark as the High Sierra, mind you, but more so than I've been used to in Southwest Colorado. 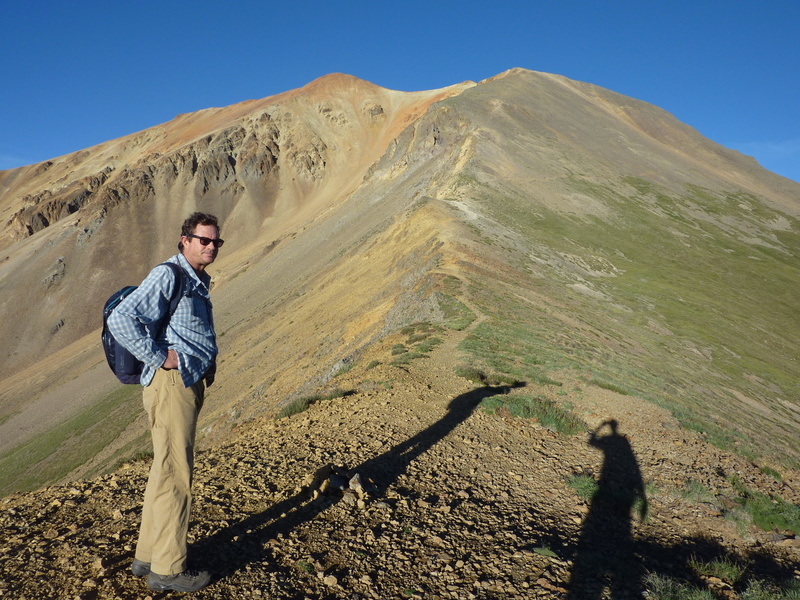 We spent two hours climbing to the saddle half a mile northeast of Redcloud Peak, our first stop. The trail used to go down the south side of the saddle as shown on the topo map, but it looks to see little traffic these days and has fallen into disuse. Everyone turns right here to head for Redcloud, of course, as popular a 14er route as there is. Though no longer the weekend, it still sees good traffic on weekdays in the summer as we shared the route with half a dozen other parties. We took another 45min to follow the continuing trail up through the talus slopes to Redcloud's summit, arriving shortly before 8a. The peak is aptly named, a bright orange-red color for the upper 500ft or so. The flattish summit overlooks a great swath of the range in all directions. Eric wanted to keep moving while he had the energy, so after taking a few pictures we headed south along the ridge to Sunshine Peak, another 1.3mi in that direction. We were happy to find an excellent trail traversing the ridge between the two points, nicely bypassing an intermediate highpoint with little prominence. There was hardly a cloud in the sky and the air was crisp and cool - excellent for a high altitude ridge-walking. Our pace was slow and leisurely, taking us about an hour to cover the distance between the two peaks. A petite woman came up shortly behind us and offered to take our picture. We would run into her the next day on our hike to Uncompahgre, and, as we found the next day, she had climbed Wetterhorn the previous day when I was on the mountain. She took off shortly after arriving on Sunshine, citing her waiting husband back on Redcloud that she needed to retrieve. That got a laugh from us as we bade goodbye. While Eric and I were resting atop Sunshine, we discussed the various options from this point. Eric already knew that I planned to climb a bonus peak, unofficially named Sundog, a 13er connected to Sunshine's West Ridge through a saddle. We had already seen a trail heading down to the South Fork from lower on the West Ridge, as noted while traversing between the two 14ers. It travels through a great many acres of talus before reaching easier ground below, with a short cliff band to negotiate in the middle. This is one of the routes shown in our 14er guidebooks, and Eric's planned descent after we both went down the West Ridge. Eric was a bit nervous because we couldn't see the trail dropping down through cliff band and I would be abandoning him before this point. We spied another climber coming up to the West Ridge from below, on the very trail Eric would be using. This made him considerably more comfortable, and convinced him to do the West Ridge route rather than return back over Redcloud. Two young women had joined us at the summit shortly before we headed down, and they, too, seemed interested in the West Ridge descent. I tried to encourage them to join us (mainly so Eric would have company), but they never did come down that way. The West Ridge starts as an untrailed talus descent, but a trail soon forms and continues all the way down the mountain into the South Fork drainage. We met up with the other climber and stopped for a short chat, as a way to offer Eric some additional assurances. He described it as a use trail all the way down, the steep chute through the cliff band being the crux, probably easier going down than up because of loose sand. We continued down at a slow pace, Eric's knees having more trouble on the downhills. Our routes diverged before the saddle with Sundog, at a flatish green area marked by a cairn which we reached just after 9:30a, and here we split up. Alone, my pace picked up considerably as I spent the next half hour climbing to the summit of Sundog along a rocky, moderate ridgeline, with a bit of good scrambling. I would pause every 50yds or so to look back at Eric's route to see if he'd made it down the chute, but I could not spot him either above or below. I was beginning to worry that maybe he got stuck in there somewhere and pondered what to do. I could continue north along the ridge as planned to join the main trail below and then go back to the car, but it was likely I'd be waiting for an hour or more for Eric to return - if he wasn't stuck in the chute, that is. I could also continue down the ridge and then return back up the South Fork to look for him, but that would be an extra few miles and a lot of work, and it would be awful if I somehow missed him as we crossed paths in the large morraine field below the cliff. I decided the best course was to return back south along the ridge, then down Eric's route from above. I was perhaps 1/3 of the way back along the ridge when I finally spied Eric below the chute and making his way along one of the various trails through the moraine. At this point I figured I'd continue south on the ridge and join Eric below, not the easiest way back, but we'd be able to hike more together. I found the first chute that I could take down through the cliffs before reaching the saddle and well before where I'd left Eric. This would save me considerable time. The chute was steep and narrow, filled with lots of loose rock, but not really dangerous as there was plenty of sand too, offering good braking as I bombed down it. There was lots of talus to scramble through below that, but I eventually found a good trail marked by large cairns going right down the bottom of the canyon. It was much better than the trail Eric was following, and it allowed me to easily get ahead of him. We were separated by the talus mounds of the moraine, so he couldn't see me, and in fact had not seen me descending at all. I found a large rock out in the flatter spot of the valley where the trails merged and waited for Eric to come into view. I spotted him well before he noticed me sitting there, so I got to watch the astonishment on his face when he finally caught sight of me. He thought I had somehow come down the cliffy East Face of Sundog which would have been an impressive feat, I agreed. I described to him my concern for his safety as to why my route plans had changed. It turns out the first chute he tried to descend was not the correct one, much steeper with a small stream flowing down the center. He climbed up back out of that one, went to the other side of a pinnacle, and discovered the correct chute with a steep trail going down it. It had been a bit concerning for him, but he described it as a good learning exercise for which he had a satisfied sense of accomplishment. Alls well that ends well. We had less than three miles to return to the car, all on good trail, but it would take us close to two hours. Eric's pace had slowed considerbly through the moraine and did not pick up as the trail improved. He was tired, his knees hurt, and we would need to take a few breaks. It was a lovely descent though, going through a very lush portion of the South Fork, across Silver Creek on a cludged bridge to join the main trail, and then down that portion of the Silver Creek drainage that we'd missed in the dark on the way up. Even with the very slow finish, we were done before 12:30p, only half an hour past our planned return by noon.